DISCLAIMER: The below is not intended as legal advice or counsel and should not be followed as such. If you have an intellectual property law issue, consult with an attorney because this blog post does qualify as legal representation and is written for informational and entertainment purposes only. It’s true that most people have no legal training. But I didn’t think you needed to go to law school to understand that if you get a product or service for free, YOU are what’s for sale. So that means: Snapchat owns your snaps. Instagram owns your ‘grams. Twitter owns your tweets. Facebook owns your statuses, photos, videos, messages, and whatever else you put on there. There’s also this neat thing called “the public domain”. Anything that isn’t copyrighted is part of the public domain, and can be used by anyone, whether or not they give you credit. Not everything can be protected under intellectual property, and there are three different layers. A copyright protects the original expression of an artistic work, e.g. a book. A trademark protects a brand name and accompanying logos. Both “Coca-Cola”,and the cursive script it’s written in are trademarks. Patents protect physical inventions that make the required “innovative leap” from already existing devices. So how does this apply to social media. Hashtags are not copyrightable because they don’t qualify as an artistic work. A poem in your Facebook status could be copyrighted, however. Hashtags can be trademarked, but only if you’re using them to sell goods as part of a business (ie, coffee mugs or t-shirts). The business part is important, because that’s what tripped up the creator of #BlackGirlMagic. (In my opinion, the fact that her shirts said “Black girls are…magic!” rather than #BlackGirlMagic is also part of it). Even if you have a trademark, you can’t stop other people from using the hashtag in their tweets. For instance, a Black woman came up with the “Me Too” sexual assault awareness campaign ten years ago. She wrote a blog post about but didn’t get the credit. In my opinion, she has no right to be mad. If she had a website or a nonprofit called “Me Too”, then fine. But social media has a very short half life. When I googled”me too sexual assault”, Ms. Burke’s blog wasn’t even on the first page of my Google results (and let’s be real, nobody goes past the first page unless it’s for a school assignment). Get your SEO search together and hush. Some things you have to be okay with not getting credit for. There’s so much information out there that you’re basically shouting into a void unless you take proactive steps to stand out. Well excuse the heck outta me. Last time I checked, law school was graded on a curve which means IT’S PURPOSELY SET UP SO THAT SOMEONE GETS SCREWED. Despite the fact that the entire class may have an 85% or greater understanding of the material, the curve dictates that somebody’s going to get a grade of 70% because of the curve. I busted my behind in law school after being on the Dean’s List my whole life, but I barely squeaked by in the upper 50%. Mind you, I never received any actual negative feedback on my papers and exams the whole time. But because of the curve, most of my grades were mediocre even though I had an above average understanding of the material. Law might be the only profession where you need an advanced degree and a state license but your grades still matter. Nobody asks doctors or CPAs for their class rank, so why does it matter for lawyers? If you have to be in the top 25% to get a job at a law firm, why didn’t they just flunk me out after the first semester of 1L year when I was only $10k in the student loan debt hole? I could have gotten 2.5 years of my life back. Anyway. I hope my loyal readers (shoutout to all five of you, much love!) weren’t too bored by my rant. I’ll write about something more entertaining next time but I needed to whine a little bit before I go back to being adult. I know I just have to keep the faith. I only need one yes, after all. Since 2002 when Heather Armstrong got fired for making objectionable comments about her workplace on her blog, social media has exploded. It’s now an inescapable fact of life that we’re living in what amounts to a self-imposed surveillance state. Headed out to the store in your IDGAF comfy clothes? Don’t be surprised if you end up on People of Walmart. If you get into a barroom brawl you might see it later on Worldstar Hip-Hop. Between Twitter, Facebook, Vine, Instagram, Snapchat and the memes that accompany every news item of note, privacy is all but dead. But for all of us who are not celebrities, the internet presence that’s attributed to you is usually of your own choosing. Unless you’re applying for a job that requires some type of government clearance, most employers are not going to go any further than a Google search and a standard background check. So if you don’t put your government name on all your social media accounts (and don’t follow/friend all your coworkers), you can maintain some level of privacy on the internet. The National Labor Relations Board recently passed down a ruling which states that employees cannot be fired for criticizing their employer online. It’s considered protected activity. 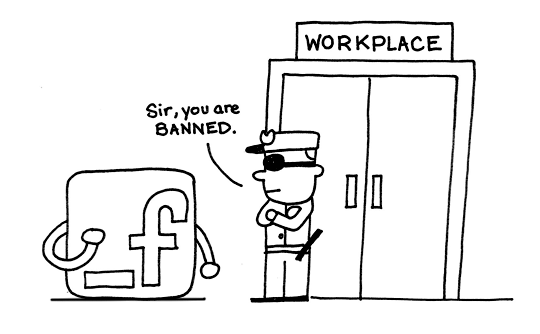 This squares with the NLRB’s general policy on social media. This doesn’t give you the all clear, though- you can still be fired for posts that are not considered protected activity (such as untrue statements about the employer, disclosure of confidential information, or racist/sexist/harassing comments that contribute to a hostile work environment). And this doesn’t take into account the ways in which your outspokenness about job conditions (or even religion or politics) may make a bad impression on your employer, leading the company to place you under scrutiny without your knowledge. The lesson? Social media and your job don’t mix. If you’re in a creative field, then having a bold personality is part of your brand. Nobody wants a musician who is wholly without opinions, and a little controversy can differentiate a stylist or photographer from the crowd. As for the rest of us, no news is generally good news. The absence of an internet presence can scare employers off because nobody wants to hire a complete unknown. It just depends on how much you want to reveal. As a newbie lawyer, I err on the side of caution. My job is to be objective and so until I have an established track record, I’d rather not have all my opinions on display. When it comes to my job, I try not to blog, Facebook or tweet anything negative. Had a tough day at work? CALL A FRIEND. It’s highly unlikely that your BFF is going to record the conversation and send it to your boss. It’s much more likely that one of your coworkers will screenshot your complaints about your boss and save them for a rainy day. Stay woke and remember- LOOSE LIPS EQUAL PINK SLIPS. Every day when I wake up, I have to remind myself how blessed I am. Approximately 1/3 of the population has a college degree. There are about 1 million active, licensed attorneys and the US had a population of 316.1 million people as of 2013. I am part of an extremely elite profession that encompasses a mere 0.003% of the population. given that I am female and African-American, my status makes me somewhat exceptional. So when I wake up and start applying for jobs on Craigslist in my bathrobe, thinking of those things reminds me that I’m not a failure. 1. Malpractice suits are a real and present danger. Westlaw subscriptions are expensive. I have access to Fastcase through the bar association but it only lets me see Texas cases. Thus, I mostly stick to editing and drafting contracts because the law because the law tends to be easier to find and less variable across jurisdictions. 3. Where I am supposed to meet my clients? I don’t have office space or money to rent it. I suppose we could conference at the courthouse but that raises issues with breaking privilege and confidentiality since it’s a public space. Same thing with a random coffeehouse. I could go on….Let’s not even get into all the money I have to spend on gas and parking- I live 30 minutes away from the courthouse and there’s no such thing as free parking in Houston. Working for free costs more than just your time, contrary to what people believe. I went to a seminar today for new lawyers and the privilege disgusted me at times. Then there was a very awkward session where a retired lawyer went on a rant about the lack of respect for authority- in my opinion, a dig at the national unrest stemming from Ferguson but I could be reading too far into it. When he started talking about professional attorney, he basically stared me (and my fluffy twist-out) down. It was pretty apparent because there were only four other attendees, all sitting to the left of me and more directly in his line of sight. It really rubbed me the wrong way. Why is it that natural hair is only professional when it’s braided or bunned and essentially, tamed? My hair grows out instead of down. What of it? And although you think I just rolled out of bed and achieved this afro, in point of fact I spend a few hours each week maintain it and several minutes every morning coaxing it into its current shape. The microaggressions are real out in these streets. I don’t really have a point to this post. Except to say that there’s a lot they don’t teach you in law school. And life can be much more unfair than you thought. But there’s always hope. I’m going to make it, one way or another.